I’m wary of life guides these days. I went through a phase of ploughing through self-help manuals a decade ago and still have a pile of books selling success and unlimited cash stashed in a cupboard somewhere. Most of them were wildly out of sync with my own nature – I’m not a fiercely-driven entrepreneur seeking vast wealth or a person who is looking to find themselves (although perhaps I didn’t realise this at the time). The tips were often unrealistic too and I frequently felt demoralised when I didn’t achieve my goals. 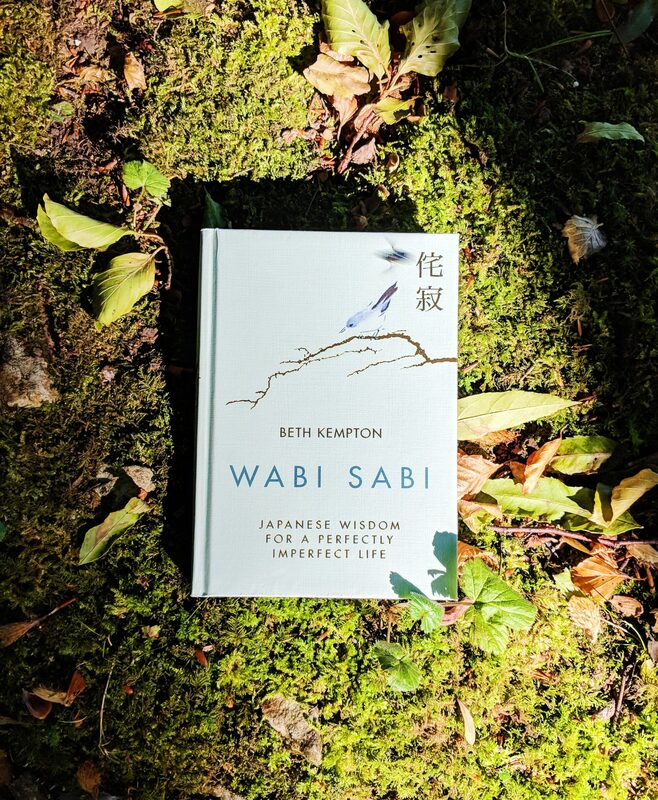 Because of this I pretty much steered clear of this genre until I heard of Wabi Sabi: Japanese Wisdom for a Perfectly Imperfect Life by Beth Kempton and thought its gentle approach might be more in tune with my lifestyle. I already knew a little of Beth’s journey and her kindness of spirit through Instagram. She’s an entrepreneur, writer and mother who really takes time to help people. She also has a longstanding connection to Japan after living and working there for many years. This deep awareness of Japanese culture coupled with Beth’s progressive attitude towards life persuaded me to buy a copy and I’m really glad I did. Physically Wabi Sabi is a compact book and beautifully produced, yet it’s size doesn’t reflect the universal scope of the themes within. These stretch from the philosophical to the practical, offering checklists and realistic ways of bringing this Japanese world view into your everyday life. Wabi Sabi is hard to define and Beth concedes this early on, but her summary below gives a basic overview of the concept. She then takes us on a considered journey through history and art to explain how the aesthetic evolved and how it manifests itself in Japanese thinking – as much as that’s possible. One thing I loved about this book is that it has a soft focus and specific answers are rarely given. You don’t have to read it in a linear way either although I would recommend this as it gives a fuller sense of the principles at work. Despite the abstract nature of Wabi Sabi, Beth Kempton provides lots of concrete examples of how to integrate this aesthetic at home and at work by sharing anecdotes from her own life. I found these particularly useful – even the small incidents such as remembering to remain positive in difficult situations (in this case making the wrong booking at a hotel) had huge value. There are also checklists and tips within each section covering subjects ranging from developing resilience to creating a wabi-sabi-inspired home. I recognised some of the pointers from coaching practice and although I wasn’t entirely sure if they fitted the rest of the text, I’m sure many readers would find them helpful. Add to this reflections on ageing, finding the right career, decluttering finances and appreciating nature and you begin to see how far-reaching the material is. It seems like a lot to cover in only 219 pages and it is, but somehow it all works brilliantly because it’s written from the heart. I felt as if I’d been on an intense retreat by the time I finished the book. Overwhelmed, yet invigorated and inspired. Wabi Sabi isn’t a one-pass read, it’s a wise little friend that you can turn to time after time. I would recommend it for anyone who’s trying to slow their lives down a little and see the bigger picture. It won’t solve all your problems but will make your life a little more perfectly imperfect. If you enjoyed this post, see our other book reviews. It’s not the first time I read about this book and definitely not the first time I come across this expression, “wabi sabi”. I understand how frustrating it can be to read lots of books “intended” to help us with life, money etc but that in the end reveal to be some sort of energy draining, and, in my case, only an anxiety trigger when you realize you won’t reach the goals or you’re simply doing so wrong from the very beginning. I’m glad to know though, this book might be an exception, I’m considering to read it soon. Thanks for sharing your impressions about your reading! Thanks so much for your comment. I hope you would enjoy this. I really liked it because it moves away from the ‘have it all’ syndrome and toward the balance and satisfaction arena in a very practical way that aligns with environmental concerns too.